We know that you have been paying far too much for your Hole In One Insurance because the people that you have been buying it from are in the business of making money by selling it to you. The rates that you see above are a sampling of popular golf outing sizes and amounts chosen. 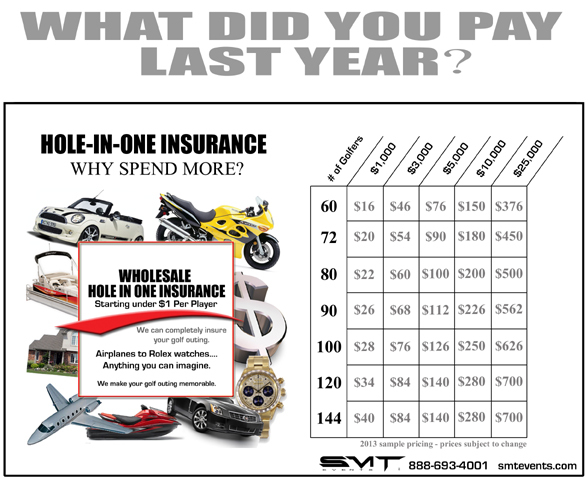 You can see that the cost for buying your Hole In One Insurance through SMT Events is far less than before as these rates are what we are being charged. We are just passing them along to you. Of course you have to buy your own sign for the sponsor if you like, but hey, that is twenty bucks or so, we think you can handle that with the savings you just found. Give us a call at 888-693-4001 to get your Hole In One Insurance taken care of for your next golf outing.